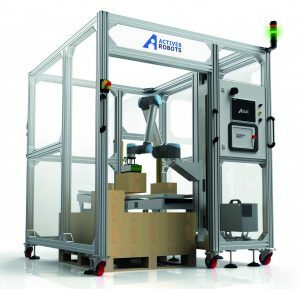 Active8 Robots has developed optional extras available for the software behind the successful Attollo Palletiser. This now allows the technical staff, here at Active8 Robots, to be given remote access to the palletiser wherever it is working in the world. We can now, when needed, view the client’s control panel on our screen, which allows the Active8 Robots technical staff to mirror the teach pendant. This means the support we can now offer with the Palletiser is exceptional- any questions or queries? You won’t need to try and explain it over the phone, instead we can simply take a look for ourselves. Don’t have much space in your factory? That shouldn’t be a problem either. Attollo is a compact and portable automated palletiser, with a footprint of only 2m X 2.2m. Furthermore, the ease of relocation means it offers speed and flexibility when setting up your production line. On top of this, the Attollo reduces labour costs and lowers health and safety risks associated with manual handling. It’s also safe to use as it is fully guarded, with pallet entry and box infeed light guarded for ease of access. A graphical User Interface (GUI) is also built into the Attollo Palletiser to give an ease of use for any beginner. With this interface complex pallet layers can be configured without specialist programming knowledge, in order to make the most out of the space you have. Boxes can then be rotated and nudged to create a custom layer pattern. This optional extra software for the Attollo Palletiser which means that now not only can we can offer you remote support, but that you can optimise production through the reports and performance timelines generated by the software.